We’re hosting Thanksgiving this year. In addition to our regular table setting for ten, we’ll be adding eleven or twelve more. 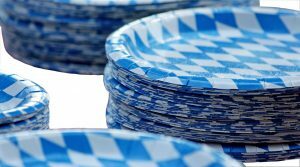 Knowing that a good deal of work goes into feeding that many people, the idea crossed my mind that it would be simplest to use paper plates for the feast. As it is, we don’t actually own a full set of china tableware for that large of a party. We have to mix-and-match three different patterns. So, my thinking was based on practicality as well as ease of clean-up. I mentioned my idea to my son who is currently our chief pot-scrubber. The look of disgust on his face said as much as he did. He had a valid point. And it got me thinking about how we can become so interested in comfort and ease that we forget there are times that and people who deserve more (more attention, more effort, more sacrifice). 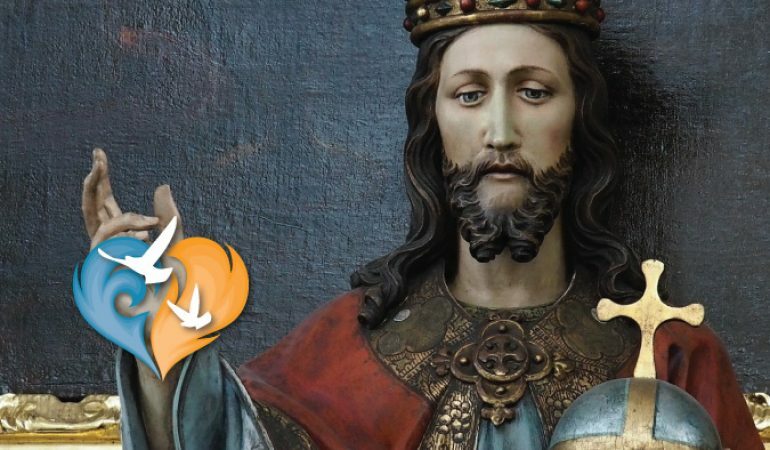 This coming Sunday, November 26th the Church will celebrate the Feast of Christ the King. In 1925 Pope Pius XI assigned the last Sunday of the liturgical year as a celebration of Jesus’s Role as King over all Creation. Of course, the whole liturgical calendar is chock-full of feast days, so it isn’t necessarily a surprise that this Solemnity might not garner the attention it rightly deserves. And, in truth, every Lord’s Day ought to inspire us to go-the-extra-mile for the Holy Mass. But, in this day and age when comfort and convenience reign, I think perhaps we’d all do well to reflect more deeply on this upcoming feast day and how we might better honor it. As I said, every Holy Mass is a personal invitation from Jesus. He calls us each and every one to worship our Creator, to hear His Word and to receive His very Body and Blood. The God of the universe calls you by name and presents Himself for your reception. I’m willing to bet if the average man or woman got an invitation to attend a dinner at the White House, a reception with the Queen of England or an audience of the Pope, he or she wouldn’t dream of declining the invitation. Rather, they would, no doubt, consider it an honor and make every effort to present their best selves (dressed in their best, using their best manners, etc.). Yet, how often do we treat our invitation to the Holy Mass like just a bit of junk mail? Or perhaps, we attend, but we treat non-holidays (every Sunday except Easter and Christmas) like Casual Fridays. As of late my husband and I have been watching programming that depicts by-gone days. From the sumptuous meals served at Downton Abbey to the ornate uniforms of the soldiers in Turn: Washington’s Spies, it is obvious that once-upon-a-time etiquette and tradition dictated much of our lives. Our forefathers (and mothers) followed protocol. Everything from how to address a letter to how to dress for a garden party was clearly outlined. Men and women carried on the traditions which were passed down to them. And they, in turn, taught their children how to live. Though you could argue that some traditions might have been overly restrictive (thinking of corsets and petticoats), many more served to facilitate a world that valued Truth, Beauty and Goodness. Conversely, nowadays our culture promotes, to our detriment — fast, furious and fun. No one is seen as deserving more from us. 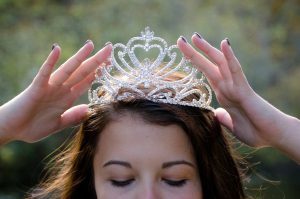 We’ve become our own kings and queens such that nearly everything we choose is meant to serve our individual preferences. Who wants to go the extra mile when there’s a reward for just showing up? I could serve my guests food on paper plates. It would save me the time and energy of having to wash the good dishes. But then again, preparing a beautiful table (albeit with a variety of patterns) speaks something. It tells my guests this day is something more than ordinary. The feast to which they’ve been invited is special and, by extension, their presence at it is special. This Sunday’s Solemnity of Christ the King affords us the opportunity to recognize the True King of the Universe. The last day of the liturgical year invites us to see Jesus as the Supreme Head over all. Before we jump into the penitential season of Advent and fast forward our thoughts to the birth of our Savior, this Sunday means to celebrate the fact that we serve a King, Who Is, Who Was and Who Will Be. Let’s remember that more than any earthly king, politician or celebrity, Christ deserves our best. He gave us His all and reserved a place for us in His Kingdom. Let us give Him more of ourselves: more of our time, more of our attention, more of our consideration, more of our patience, more of our talents, more of our treasure, more of our love. Listen to #IBT2018 speaker, Scott Hahn’s A Royal Truth: Scott Hahn Reflects on the Solemnity of Christ the King. Pray a novena to Christ the King.